The final piece of the Staff is within grasp...inside a fiery volcano. Sleep once again and receive a vision from Ria Silmane. Travel to Ebonheart, Morrowind and speak with its ruler. Recover the Hammer of Gharen from Black Gate. Exchange the Hammer for the knowledge of the location of the entrance to Dagoth-Ur. Go to Dagoth-Ur and reclaim the final piece of the Staff of Chaos. "I would take no chances, for Tharn has no mercy and will attack the moment he perceives the Staff reassembled. You must be swift. To the northeast lies the fire mountain, Dagoth-Ur. Somewhere in its volcanic depths is the final piece of the Staff of Chaos. The entrance to that fabled mountain has disappeared with the Dwarves that mined it. There may still be those who know of it, however. Find the entrance, enter the volcanic catacombs, and return with the final piece of the Staff. We are so close, I wish you well..."
Asking around about Dagoth-Ur leads you eventually to the palace in Ebonheart, Morrowind. There you are told that they do in fact have the means to tell you the location of the entrance to Dagoth-Ur. They just need to hit the Hammer of Gharen on the Anvil of Mithas. The catch is that while the Anvil is readily available, the Hammer lies somewhere in the depths of a dungeon known as Black Gate. Black Gate, just southwest of Ebonheart, is a bi-level dungeon with a large area to explore. The monsters aren't so bad, but of course be ready for anything. You will encounter Stone Golems, rats, ghouls, homonculi, medusa (bring Potions of Free Action), wraiths, hell hounds and iron golems. This time you won't really need Levitation if you don't want to explore, but bring lots of Potions of Heal True. On the first level, the way down is a bit west of center. Swim south in the canal just west of the entrance, go west at the first intersecting canal, then go south at the next intersecting canal. Continue a short way south and go through a hidden door that leads to a short corridor west and into a room. The way down is just a bit west of that room as the crow flies. If you have Passwall, you can avoid some monsters and some walking by cutting through the west wall of that room. Otherwise, go two doors south, two doors west, and find the hidden door north into the monster-filled room, which contains the route down. The second level is flooded, but also contains a few dry rooms. You will first have to answer a riddle (answer: rain) to have access to the level. The Hammer resides in a large room in the southwest section. But while you won't have to answer another riddle to get in, you will have to find one of three keys. There are three entrances to this room: a ruby key door (92,101), an emerald key door (76,110), and a sapphire key door (101,113). None are particularly accessible, especially the emerald key door, but all lead to the area containing the Hammer. The keys themselves are scattered on the level. 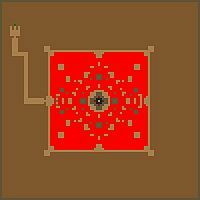 The ruby key is on the floor in a small room in the northwest (115,21). The emerald key is on the floor in a small room in the north central (58,14). The sapphire key is sometimes unavailable. When it exists, it is held by an iron golem (99,111). Fortunately, you needn't get all of the keys. Any key, once acquired, will get you into the Hammer area through the appropriate door. Your best bet is to see if you can get the sapphire key off the golem, as he is just a short distance south and is guarding a door appropriate to the key he's holding. To get to the golem, simply walk south after the riddle-door, then pick the western door, walk to the west until you reach the water, and then follow one of the walkways directly south. The Golem right in front of the door he's guarding. If that fails, the ruby key is probably the easiest to get, and the ruby key door is certainly the easiest door to get to. There is a hidden room in this area, but it is completely empty. Enter the room, defeat the iron golem and fire daemon, and grab the Hammer off its platform (91,117). Back at the palace, return with the Hammer so he can strike the Anvil and learn the location of the entrance to the volcano Dagoth-Ur. Before you attempt the final quest, make sure you have several Potions of Heal True, Resist Fire and Shock, and Levitation. Passwall will be of great help in this dungeon as well. This level contains a weird little room in the west you can reach by raised walkway. What's weird is that when you enter the room, you will still hover above the ground as if you are still on the walkway. That wouldn't matter if there weren't piles and piles of treasure in the room you can't pick up because you can't get low enough to reach them. The way to reach them is to cut a hole in the west wall using Passwall and go to the newly revealed floor. You will descend to the floor, and then you can grab the treasure. The second level is large, and without Skeleton's Key you are required to find at least one key to a magically-locked door; if you don't have Passwall either, you'll have to find four other such keys. 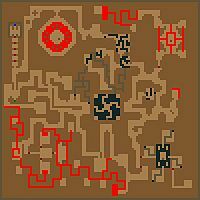 If you have Skeleton's Key, you can go straight north and open the magically-locked doors one by one, completely avoiding the dungeon crawl. If you have Passwall, you can cut through the walls and avoid the ruby key door (92,30), the sapphire key door (92,27), crystal key door (92,24), and the amethyst key door (92,21). You cannot Passwall around the diamond key door (92,18); you have to either get the diamond key or use Skeleton's Key. Without the artifact or Passwall, get set for an arduous and dangerous dungeon crawl. 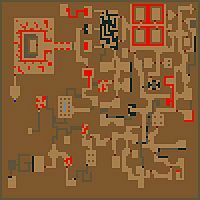 The ruby key is in the northwest behind a lava moat and is guarded by an iron golem (70,19). Go up the first corridor north and make your way to the room, where you'll find the key on a platform. The diamond key is in a pit room in the center of the level (46,59). You can get there by going east then south then east from the lava moat room, traversing a trench room going south, then ducking into a tunnel south till you emerge into the pit room. You'll know you're there when you hear the lich's scream of outrage at your presence. The key is on a platform on the south wall of the room. If you needed only the diamond key, you can go right back the way you came. The sapphire key is northeast of the diamond key in a lava room guarded by a fire daemon (14,20). Go back the way you came, then when you come out of the tunnel, loop around to the room with the key. It's on a platform inside the lava rectangle. The amethyst key is in a room in the southeast corner of the level (18,79). You can just make your way south through the corridors; as soon as you see a door to the east, take it and you'll find yourself in the right place. The vampire in that room will try to defend it, so for once you cannot avoid a vampire and will have to fight him. Fortunately, you can still rest for zero hours when he's down - just like with trolls. The key is on a platform on the center area with the vampire. The crystal key is in a room in the southwest corner guarded by a medusa (68,80). The most direct way to it is to swim west in the lava canal that flows east-west along the south of the level. It might be quicker, though, to avoid the lava and the monsters on the way by arcing up northwest, then south, then through a couple of doors east to the room where the key is. Grab it off the platform and head back to the magically-locked doors. Once you get all the doors open, go down. The bottom level is fairly simple in concept. It's mostly a huge lake of lava, in the center of which is the eighth and final Staff piece (50,50). You can actually even get it without answering a riddle. However, you cannot get out without answering a riddle (answer: e). "I congratulate you on your success. Have you discovered however, what I have known all along? The Staff is drained of all magical potential. I did it myself before scattering the pieces across the realm. It is a useless stick, good for churning butter or rowing a boat, but not for saving the Emperor. Come find me if you dare, and I will relieve you of any further burdens you may think to face. My legions await..."
This page was last modified on 16 February 2019, at 04:07.